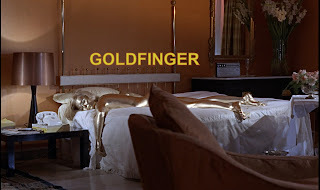 This week on Hit me with your best shot we continued our 1964 anniversary celebrations (after "Zorba the Greek" two weeks ago) by looking at the classic James Bond film "Goldfinger". This popular entry in the franchise is quintessential Bond - the theme song, the women, the cheesy one-liners, the cool gadgets. It's fairly enjoyable but I didn't find it as visually exciting as I'd hoped (apart from some cool aerial shots). The shot below is the only one that I found especially interesting. One of the most fascinating things about this iteration of James Bond is how ineffective he is. I thought the composition of this shot reflects this quite well. As he tries to track down a criminal suspect, he's completely oblivious to the shooter behind him. This repeats itself throughout the film, as the bad guys always seem to be one step ahead of our hero. Of course, he still ends up saving the day but it's amusing to see how much he stumbles along the way. We chose the same shot! I do like that you point out how much Bond just kind of fumbles his way to saving the day here. It's funny how the film clearly indicates that he's a capable agent, but he more or less gets lucky at several key moments. Bond's practically Inspector Clouseau here, just not as goofy. was that shot ever popular! i also considered it before finding my thesis.